John MacNeacail of MacNeacail and Scorrybreac, Chief of the Highland Clan MacNeacail. John MacNeacail (pictured below) was born on 20th March 1950 in Launceston, Tasmania and educated at Scotch College, Launceston and Eisenhower High School, California, USA. As Skye traditions strongly suggest that there are twenty eight MacNeacail chiefs buried on St. Columba's Island, and assuming that the last or 28th chief to be buried there was Donald, who died about 1825, the last chief to die in Skye, John could thus be considered to be the thirty fourth chief. John became chief on the death of his father, Iain, in October 2003. He resides in Ballina, NSW, with his wife, Jenni, and they have two sons, the Clan tanist, Luke, born in Canberra in 1979, and Adam, born in Pambula, NSW in 1983. John is a company director and investor with interests in real estate agencies and property in northern NSW and Queensland. 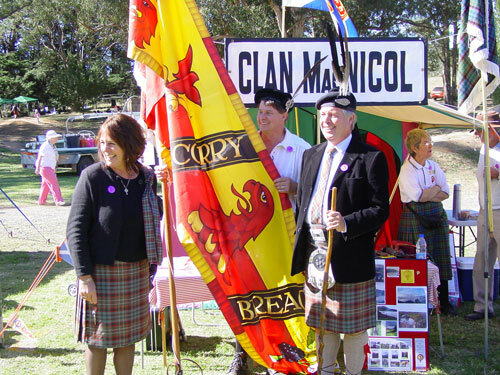 Clan MacNeacail is a very ancient highland clan based on the Isle of Skye, but a Clan which is very active today. The clan now has a strong membership in Scotland, England, Australia, New Zealand, the United States and Canada. 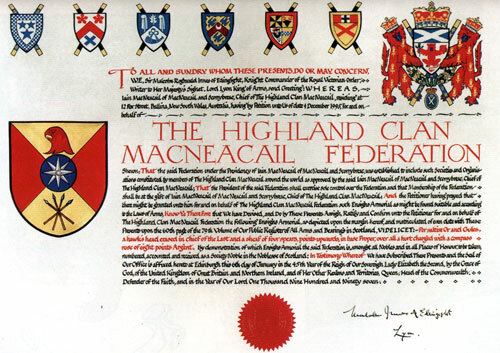 Its clan societies around the world are members of The Highland Clan MacNeacail Federation. Clan newsletters are published quarterly in Scotland, Australia and North America. In 1987, by worldwide subscription, the Clan purchased part of its traditional land on the Isle of Skye which is now administered by a trust on behalf of Clan members worldwide. This incredibly beautiful and rugged 140 acres lies just north of Portree and its rugged cliffs run down into the sea loch. The trust has a continuing plan to conserve the land and provide walking paths for the enjoyment of all. In 1997 the Highland Clan MacNeacail Federation became a Founder of the Museum of Scotland, the only Scottish clan to do so, and its name is proudly engraved in the entrance foyer of this world class museum.